Overview: Stories of the Stratosphere, Mi­chael G. Bennett, Joey Eschrich & Ed Finn, eds. (ASU Center for Science and the Imagination) August 2017. Tor.com has had a run of strong stories in the past couple of months. Best of them is Greg Egan‘s “Uncanny Valley“, posted on August 9, which deals shrewdly and poignantly with the question of whether the “copy” of a dead man is synonymous with the once-living man himself, or a totally new personality, and which of the man’s memories have been left out of the creation of the copy, and why. Linda Nagata‘s “The Martian Obelisk“, posted on July 19, shows us how the project of building a bittersweet memorial to humanity’s now-failed attempt to spread beyond the Earth is interrupted by an unexpected emergency that may change everything. Stephen Baxter‘s “The Martian in the Woods“, posted on August 2, an unlikely but surprisingly effective blend of H.P. Lovecraft-style horror with H.G. Wells, gives us a forest in England grown haunted and strange by the presence within of one of the surviving Martians from the invasion depicted in Wells’s The War of the Worlds. “Sanctuary” by Allen M. Steele, in what is pretty obviously the first installment of a de facto serialization, describes a mission to another planet that goes completely and catastrophically wrong, stranding the human crew on a world where any­thing made of plastic or metal is quickly eaten by ravenous microrganisms, and leaving them about to face First Contact with natives who have developed technologies which use wood and ceramics instead. 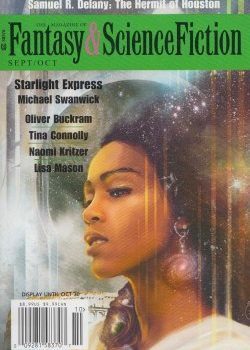 The September/October issue of F&SF is a strong one. Best story here is “Starlight Express” by Michael Swanwick, a melancholy and evocative story about a man in a far-future Rome who en­counters a mysterious woman, only to inevitably lose her again. Also substantial here, although it probably won’t satisfy some readers, is Samuel R. Delany‘s first story for F&SF in 40 years (since 1977), “The Hermit of Houston“. Those looking for a strongly plotted or action-filled tale are not going to find it here; instead, this is an old man’s rambling, discursive reminiscence, jumping back and forth in time, of his long life in a world that has been shattered and reshaped by some unspecified disaster or series of disasters (probably climate change-related), with national boundaries redrawn and society’s views on sexual identity rethought, so that both men and women as we define them today have been sorted into many different genders, “natural” procreation is sternly discouraged, and much of the rearing of children is left to youth gangs and armies. 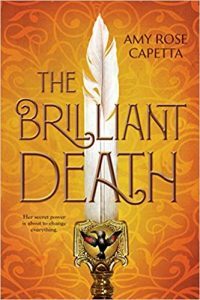 The story can be hard to chew in some spots, at its most discursive, but if you stick with it, it will reward you with some fascinating social speculation about a different kind of future society and some compelling imagery. (Warning: the story is also much more sexually explicit than is usual for F&SF.) Also good in September/October is Naomi Kritzer‘s “Evil Opposite“, in which a graduate student who invents a “quantum spyglass” must learn to navigate through the infinite possible versions of his own life, and perhaps learn some lessons from the mistakes other versions of himself are making. Robert Reed‘s “Leash on a Man“, in which a high-security prison – and, in particular, one Neanderthal prison guard – must rise to the chal­lenges involved in housing a new super-smart prisoner who had murdered an entire world; and in a broadly satiric mode, in “Hollywood Squid“, Oliver Buckram offers a zany farce with a few good laughs in it about a squid-like alien who wants to become a movie star. The other type of anthology common this year features what Jonathan Strahan has aptly called “Think Tank Fiction,” consisting of futurology-based speculation about what the near-future is going to be like, often shading into catastrophic climate-change fiction, often sponsored by some major corporation, and frequently available only online with no actual physical book existing. We’ve already seen and reviewed two good examples of this kind of non-print anthology, A Flight to the Future, edited by Kathryn Cramer, and Wired: The Fiction Issue – Tales from an Uncertain Future, editor unknown, both available only online (or in the November issue of Wired, in the case of the later), and now we have another one, Stories in the Stratosphere, from Arizonia State University, edited by Michael G. Bennett, Joey Eschrich & Ed Finn. The fiction part of the anthol­ogy consists of four very short stories by Carter Scholz, Brenda Cooper, Karl Schroeder, and David Brin & Tobias Buckell, all dealing with the use of “stratollites,” enormous balloons designed to hover in the stratosphere, the outermost layer of the Earth’s atmosphere, just before outer space, showing the many uses to which they can be put – and some of the things that might go wrong as well. None of these stories is likely to end up being considered among the year’s best stories, but they’re entertaining and fun to read. No print edition is available, but Stories in the Stratosphere can be downloaded in various formats from <csi.asu.edu/books/overview/>. Gardner Dozois was the editor of Asimov’s Science Fiction magazine for almost twenty years, and also edits the annual anthology series The Year’s Best Science Fiction, which has won the Locus Award for Best Anthology more than any other anthology series in history, and which is now up to its Thirty-Fourth Annual Collection. He’s won the Hugo Award fifteen times as the year’s Best Editor, won the Locus Award thirty-one times, including an unprecedented sixteen times in a row as Best Editor, and has won the Nebula Award twice, as well as a Sidewise Award, for his own short fiction, which has been most recently collected in When the Great Days Come. He is the author or editor of more than a hundred books, including a novel written in collaboration with George R.R. Martin and Daniel Abraham, Hunter’s Run, and, in addition to many solo anthologies, the anthologies, Songs of the Dying Earth, Warriors, Dangerous Women, and Rogues, all co-edited with George R.R. Martin, the last two of which were New York Times bestsellers. Coming up is a major solo fantasy anthology, The Book of Swords. He has been inducted into the Science Fiction Hall of Fame, and won the Skylark Award for Lifetime Achievement in Science Fiction. Born in Salem, Massachusetts, he now lives in Philadelphia, Pennsylvania.